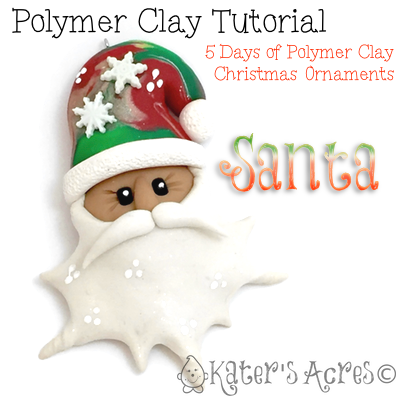 This polymer clay christmas ornament tutorial for this jolly Santa can be whipped up in less than 10 minutes. Make one or several. Use them as small gifts, stocking stuffer, or even to tie onto packages for cute doses of whimsical Christmas fun. ENJOY! Using a hazelnut sized portion of luminescent skin colored clay, roll it into a ball. Gently flatten this ball using the palm of your hand. Add two eyes and a small nose to the clay. Pinch small sections around the ball. TIP: Leave ONE section unpinched to “wrap” around his face as the beard. Wrap this beard around your face. Add a mustache from more glistening snow colored clay. Place onto the top of Santa’s head and shape into a pleasing “hat” shape. Add another small ball of glistening snow colored clay for the ball on Santa’s hat. Thank you! I’m glad you’re having such a great time!